This installation by the Korean artist Woojung Chun presents an imagined library furnished with bookcases, cabinets and globes, all recognizable as symbols of a place where knowledge resides. Chun reveals her library as ‘a place of persistent search for elusive questions: unsolved theories, unexplained narratives and unresolved philosophical debates’. She has been inspired in part by Borges’ text, ‘The Library of Babel’, which compares the library to the universe as a repository for all knowledge and every individual truth. 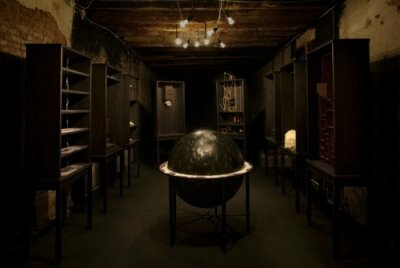 Displayed in a darkened space, the installation seems at first to be a library from a palatial house of a past era: although apparently furnished conventionally, further inspection reveals that there are no books in the bookcases and that the globes are not covered with maps of the world. The dark wooden bookcases are meticulously crafted cabinets containing arcane and intriguing objects and tableaux, often surrealist in spirit. One cabinet contains repeated photographs of faces with mouths swallowing an endless string of letters and numbers; another has a chest of drawers with roots growing from its base. Others contains a puzzling, complex construction of boxes, strings and pulleys, or are inscribed with diagrammatic, alchemical drawings. A naked figure, curled up seemingly asleep, inhabits one cabinet; while brass implements of quasi-scientific origin are displayed in another case. The two globes stand among the bookcases, one representing the life of nature with beings moving and floating across the earth’s surface, while the other represents a kind of labyrinth of life with raised markings suggesting routes across a dark universe. Woojung Chun was born in Seoul in 1976, and currently lives and works in the UK. Library was first shown as a solo installation as part of the 53rd International Art Exhibition – La Biennale di Venezia in 2009; and she also took part in the 12th International Cairo Biennale in early 2011. Previous exhibitions include Good Morning Mr Nam June Paik at the Korean Cultural Centre UK (2008); Lessons of Embodiment (part of Escrita na Paisagem) at the Biblioteca Municipal de Montemor-o-Novo, Portugal (2009); and Biblioteket at Luftskipet, Fjell Gard, Norway (2010).